Sunlit brick and cedar split level with full sub basement in Lexington Fields South. Enter the bright porcelain tile foyer which leads to the sunny living room. Separate dining room opens to kitchen with granite counter tops and breakfast bar/island. Beautiful huge family room with gas fireplace and large wet bar. Hardwood floors in the living, dining and family rooms. Three generous bedrooms on the upper floor with two full baths. Master bath has walk in shower. Office, large utility room and half bath on the lower level. Huge finished rec room in basement. Exquisitely landscaped yard with patio, storage shed and maintenance free vinyl fence. HVAC 2016; roof 2010; all replacement windows 2009; 200 amp circuit breaker; sump pump with battery back up. Perfect quiet location close to Woodfield Mall & Busse Woods Forest Preserve. Great schools! 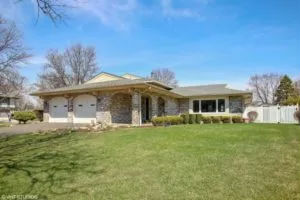 Large lovely home that has been well maintain. Beautiful family room, extra office plus full finished sub basement. Exquisite landscaping.